At the previous entry, I wrote how to WebSocket application on Server Side. However JSR 356 Java API for WebSocket is providing Client API also. 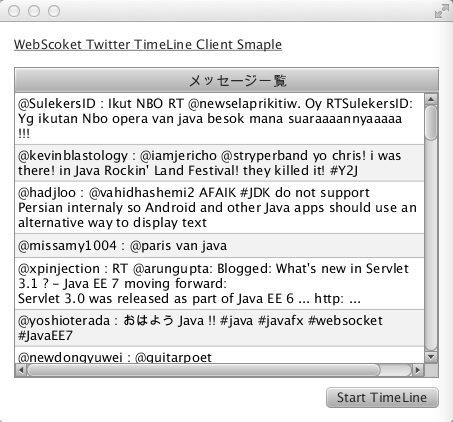 So in this entry, I will explain the WebSocket Client API with JavaFX. The image of this application is like following video. There is one button on the bottom of application. If you click the button, the application connect to WebSocket Server and receive the messages and show the message on the TableView. In order to compile and run the application, you need following libraries. You can download the Grizzly related libraries from following site. * Grizzly is a popular NetWork Server framework which is wrote by Java NIO. And originally the grizzly was created for the server engine for GlassFish. It has high scalability and good performance. If you use the grizzly libraries, you don’t need to write the low level socket programing by Java. In this client application, I will use the Grizzly to connect the WebSocket Server with less code. Also, you need to get the jar file as tyrus-servlet (reference implementation of Java API for WebSocket) and it include the javax.net.websocket package. Please get the libraries from following site ? 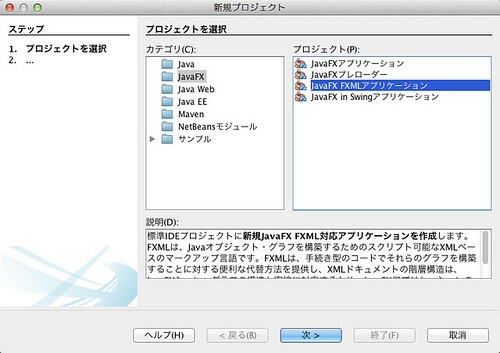 Then I will start to create a NetBeans Project by selecting JavaFX FXML Application. 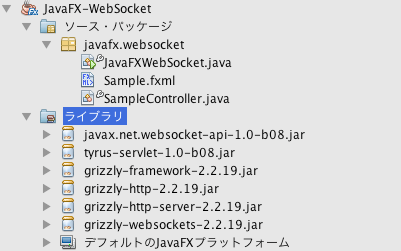 In this Project, I will specified the project name as “JavaFX-WebSocket”. After that in order to be able to use the downloaded libraries in the project,I configured and added the libraries to the project. If the project had created successfully , following 3 classes will be created by NetBeans. I will try to update the above 3 classes as follows. At first , I will customize the view(FXML). If you already configured the SceneBuilder, you can show the SceneBuilder screen on your desktop after you click the Sample.fxml file on NetBeans Project. This Sample Application is very simple. So I only change the size of the Window and added two component as Label and TableView. After drag and drop these component, I inserted the ID as “table” for TableView. And there is TableColumn inside of TableView. So I specified the ID as “column” for TableColumn. If you change the screen, you may get the FXML code like follows. After customize the View, I will start to implement the Controller of JavaFX. For JavaFXWebSocket.java , there is no need to modify in this application. So I will use the NetBeans created code. I implemented the SampleController.java as follows. At first , I inserted the “@FXML TableView table” and “@FXML TableColumn column”. The field name is the same id of FXML(fx:id=”table”, fx:id=”column” ). And I implements the action of push the button on handleButtonAction method. Twitter Streaming is long running process. So I need to implement the check program as multi thread. 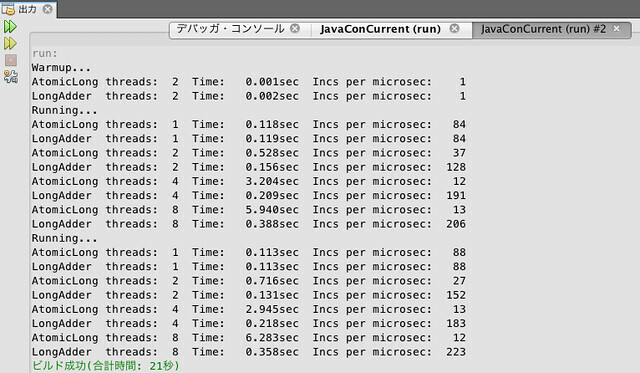 At JavaFX ,javafx.concurrent.Service, javafx.concurrent.Task classes is prepared to implement the Task. So I had used the Service class to do it. In the above class, there is initialize() method to initialize the class. In the method, I wrote column.setCellValueFactory(new PropertyValueFactory(“message”)) . This is the value configuration of the Table column. In fact, the field of “message” in RowData class will be showed on every column in the Table. I specified the javafx.scene.text.Text type instead of String type, because it was difficult to manage the size of String in the Column of TableView. So instead of String, I used the Text and Text#setWrappingWidth could manage the size of viewable String. I will pick up and explain the important point of WebSocket Client in SampleController class as follows. I wrote the comment in the code as “// ClientContainer cliContainer = ContainerProvider.getClientContainer();” In fact the above code is recommended as standard. And you should write the following property on the system property. I specified the “TwitterClient(table)” inside of cliContainer.connectToServer(new TwitterClient(table), clientURI) line. It is a WebSocket Client code which equal to the class of adding the @WebSocketEndpoint annotation at the server side. Instead of the “@WebSocketEndpoint” annotation, we must specify the “@WebSocketClient” annotation at the client side code. Following is the client side code of WebSocket client. // In order to adjst the size of String in Table, I used Text. Actually the code is very similar to the server side code. Instead of the @WebSocetEndpoint, I specified the @WebSocketClient annotation. And inside of the class, we can implements the method which is added @WebSocketOpen, @WebSocketMessage and @WebSocketClose annotation. In this program, client receive the message from the server. And there is no need to send the data to server. So I implemented the @WebSocketMessage public void onMessage(String message) method. In this method, the client receive the message from server and wrapping the String to Text object in order to adjust the length of the viewable String (Text text = new Text(message)). Finally the message is inserted into the first line of the Table. This WebSocket client code is very easy to implement. So you can write the WebSocket program very easily not only server side but also Java Application like JavaFX. In this entry, I will explain the new feature of Java EE 7. 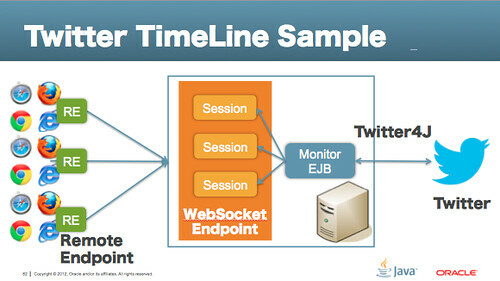 In Java EE 7, Java API for WebSocket (JSR-356) will be included. I explained these technology at Japanese Java conference as follows. 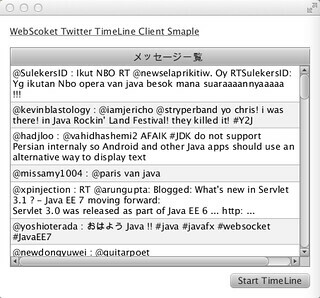 At that time, I showed the Twitter Timeline demo by using the WebSocket. So I will explain following how to create WebSocket application as standard technology of Java. Now Java EE expert group is developing and evaluating the specification of JSR-356 Java API for WebSocket. So it may be possible to change the coding style when the Java EE 7 had released officially release at next year (We are planning to release the Java EE 7 at 2013 Spring). So please note this point ? This program was created for GlassFish 4.0 b58 environment at November. You can download the promoted build of GlassFish v4.0 from following site. So please download it before the coding ? It seems that already the API had changed during this one month. Arun Gupta already mentioned about it on following entry. So if you get the latest version of the GlassFish, please refer to the above entry too? And you need to get the “Twitter4J” libraries from following site before coding. Twitter4J. Twitter4J is very very useful libraries to create Twitter service by Java. Twitter4J is created by Japanese guyes whose name is Yusuke Yamamoto-san. Actually I got two libraries as follows. Perhaps as you may know, WebSocket is able to communicate by Full duplex and bi-directional between Client and Server. And it is used the upgrade protocol of HTTP protocol as WebSocket protocol. Once WebSocket connection had established, it is possible to write the program depends on the WebSocket lifecycle. And I implemented two method on the class as initOpen, closeWebSocket. And also I specified two annotation as @WebSocketOpen, @WebSocketClose. * @WebSocketOpen initOpen : if the client access to the server, it inserted the Session to the Set(peers). Session has the information of RemoteEndpoint(client). @ @WebSocketClose closeWebSocket : if the connection had cut, it delete the Session from the Set(peers). Session has the information of RemoteEndpoint(client). Next, I created Twitter monitoring program by using Singleton EJB with Twitter4j lib. In this program, if the EJB received the new message from Twitter, the EJB automatically send the message to all of connected WebSocket Client. In the EJB, I had used the Streaming API of Twitter4J. And also I specified two annotation to the class as @Startup and @Singleton. Thus, the EJB will be automatically initialized and started the service by EJB Container when the application is started. Once EJB had loaded, initTwitterStream() method will be called by container because @PostConstruct annotation is specified to the method. 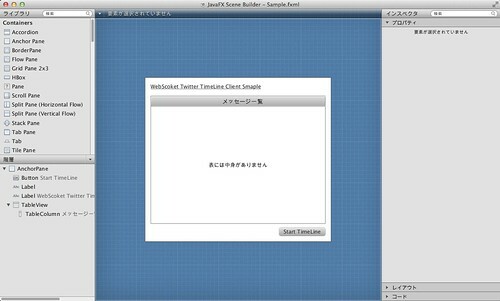 In the method, it initialized Twitter4J API and it is using the Twitter Stream API. And in this example, I specify the search keyword as “java”. In the Twitter4J, StatusAdapter is provided and onStatus() method can receive the message when the above filter had matched. So I wrote the code of publishing the message to all of connected RemoteEndpoint in this method. Of course if you would like to write JSON, you can do it. In order to run the Application, You need to get the consumer key and access Token from Twitter. http://twitter.com/oauth_clients/new After created the consumer key and access token, you need to write the following properties on twitter4j.properties file. And please placed the properties file to WEB-INF/classes ? And also you need the following libraries to compile and run. I will show the directory structure of NetBeans project as follows. Perhaps you can understand that the Java API for WebSocket API is very very easy to use. And also if you use the Singleton EJB , it is very useful to monitor the backend service. For example, please consider the DataBase monitoring instead of Twitter. If client request the DB update information to the Application Server, the Application Server will send the query to DB server for every individual request until now. However if you create the DB monitoring application like this, the load of DB may be extremery decrease. Following is the demo video of this sample application. WebSocket is the key technology included in the Java EE 7. And it is very easy to implement. 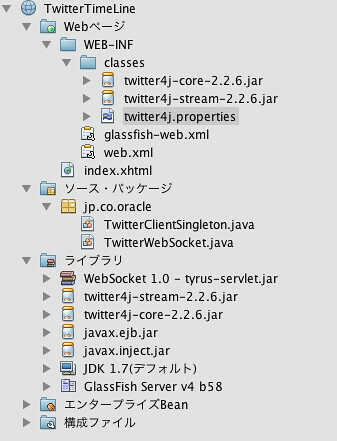 If you are interested in the WebSocket on Java Platfor, please try to use the NetBeans and GlassFish v4.